The second March and Walker Crime Novel. The latest in a series of barn fires in Leeds County turns ugly when a body is discovered inside the burned-out husk of an old hay barn near the village of Elgin. When the victim turns out to be Independent Senator Darius Lane, a renowned artist and social activist recently appointed to the upper chamber by the prime minister, Detective Inspector Ellie March of the Ontario Provincial Police finds herself coping with an RCMP national security team which must first assess whether the senator’s involvement in sensitive government business led to his brutal murder by forces hostile to Canada. While Detective Constable Kevin Walker works the case files of the previous barn fires looking for a serial arsonist within Leeds County who may have killed for the first time, Ellie discovers that the intervention of RCMP Assistant Commissioner Danny Merrick, unexpectedly polite and charming, will place her directly in the cross-hairs of a homicide investigation with national repercussions! 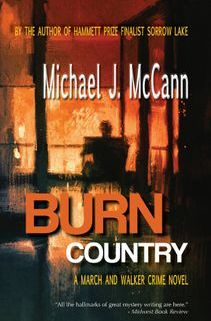 Ask your local independent bookstore to order BURN COUNTRY in paperback for you. It's available world-wide through the Ingram catalogue.